PT Petrosida Gresik - PT PG or known as "Petrosida Gresik" is a reputable company in Indonesia, running business in agro industry. Petrosida Gresik is a directly-owned subdiary company of PT Petrokimia Gresik, a leading fertilizer producers in Indonesia wholly-owned subsidiary of state-owned fertilizer holding company PT Pupuk Indonesia (Persero). PT Petrokimia Gresik Ooredoo Group is the majority shareholder in PT Petrosida Gresik with a 99.99 percent stake. Petrosida Gresik operates primarily as a producers of Pesticide active material such as Diazinon, BPMC, MIPC and Carbofuran. The Company also engaged as distributor of PT Petrokimia Gresik fertilizer. Petrosida Gresik is based in Gresik East Java and now has 5 plants located at Gresik, Sumedang, Tongas Probolinggo, Medan and Lampung. According to PT Petrokimia Gresik Annual Report 2015 as cited by JobsCDC.com, Petrosida Gresik is suﬀering loss of Rp 74.496 billion in 2015. Referring to its annual report, Petrosida Gresik reported total net revenue of Rp 1,750 billion in 2015, an increase of 17.47% over the previous year of Rp 1,490 billion. Female, maximum age of 23 years of for fresh graduate candidates and 25 years old for experienced candidates. D3/S1 majoring in Informatics Engineering, Administration. JobsCDC.com now available on android device. Download now on Google Play here. Please be aware of recruitment fraud. The entire stage of this selection process is free of charge. 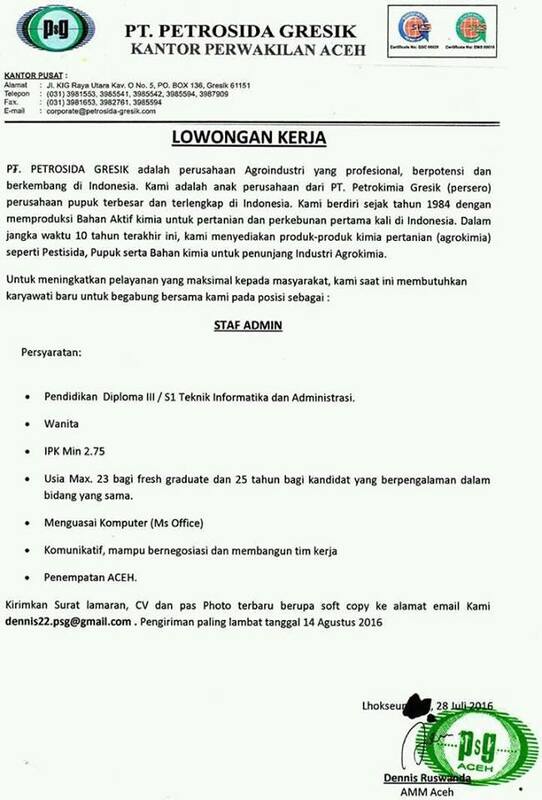 PT Petrosida Gresik - D3, S1 Fresh Graduate Admin Staff Petrokimia Gresik Group August 2016 will never ask for fees or upfront payments for any purposes during the recruitment process such as transportation and accommodation.